•	Participation is stable with the number of golfers playing today equal to the number playing 20 years ago. 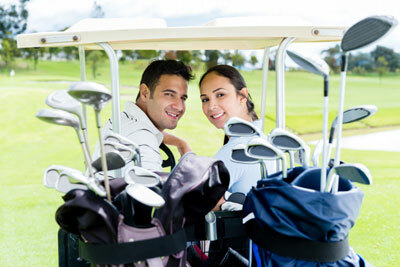 The number of avid golfers grew 3% year over year, the first increase since the recession. •	28% of golf’s best customers are Millennials and the number of young women playing the game is almost double and families of color have increased five-fold from a generation ago. •	Player development initiatives such as Get Golf Ready are actually WORKING! The number of beginners grew to a record 2.5 million people, the highest number ever. And the number of people who described themselves as non-golfers who are very interested in trying the game jumped % to 12.8 million. •	Youth programs designed to make the sport more accessible and fun – PGA Junior League, LPGA Girls Golf and Drive, Chip & Putt – held steady the number of kids playing at 2.9 million (up 400,000 from a few years ago). •	But the best news came from a sports executive outside of the golf industry, Dr. Richard Luker who created the ESPN Sports Poll and guides nearly every major sport on how Americans use their 60 hours of free time each week. He cites golf’s health benefits, time away from technology, socialization which make up loyal communities and fan engagement. This was the 10th gathering of this elite group at NGF Symposiums and the previous nine have produced the positive dialogue and critical debate that NGF founder Herb Graffis would have appreciated. This one – at the impressive World Golf Village in St Augustine – was no different. Thank you Boomers. The aging Boomer segment is entering prime time for golf participation and spend which produced a 3% gain in Avid golfers in 2016. This is comprised of 8.8 million “Golf Nuts” who drive 37% of rounds and 63% of golf spending; they love competition even is if it is just a $5 Nassau. Casual golfers number 11.3 million and cite being outdoors as key reason they play. This demand has accommodated more pricing power by courses pushing up the median cost for a round of golf to a record $45. For the last five years the industry has been told by the Boston Consulting Group and the NGF that there is significant “latent demand”… millions of people who say they are very interested in taking up the game. This number has doubled over the last five years from 6.4 million to 12.8 million. All of us who have run businesses have heard from our sales departments about long prospect lists. Identifying prospects is one thing; converting them to customers is something entirely different. The industry doubled down on investments to grow beginners through Get Golf Ready, the LPGA’s Girls’ Golf and PGA Junior League. The PGA expanded its network of player development “sales reps” who work with its sections and courses. Well it appears the big player development aircraft carrier is turning with the report that Beginners reached a high of 2.5 million last year, up 67% from 2011. Oh, and we’ve been hearing we need younger customers, more diverse players, more women in the game. Bing! Bing! Bing! Three of four beginners in 2016 are under the age of 35; compare that to 38% of existing players. One in three beginners were non-white compared to 19% of existing golfers. One in three were also female versus 24% of all golfers. Popular young stars on the PGA and LPGA tours have helped attract more young fans. The aforementioned grass roots programs are growing participation. But golf still faces some hurdles with young people. To that end, the NGF embarked on a deep dive on Junior Participation and shared some early results. Most notably, youth participation in the age 10-13 segment is up 70%, though social media has contributed to an 18% decline among the 14-17 year old segment. Looking at the competition for kids’ time (and their parents’ dollars) showed the sport has some work to do. Benchmarking golf against traditional sports such as baseball, basketball and football the report shows kids rank our game low on key indexes of fun to play, cool to follow, popular with friends. And 75% of kids say golf is “difficult”. This info supports the collegial environment created by the PGA’s Junior League Golf; look for the industry to increase its support of that program. Most intriguing was the study cited by Rich Luker about the anxiety today’s social media world has created among us, especially Generation Z. A whopping 78% of kids aged 12-17 are consciously seeking out activities which get them away from the grind of their digital networks…he thinks golf is well positioned to take advantage of this trend. The success of Topgolf has been followed by new entries such as Flying Tee, Fore and Drive Shack. In total there are 20 million people who play golf something than traditional golf and 8 million have never set foot on a course. This is feeding the conversion of latent demand to actual players as this group is 5x more likely to play a round. And there are another 20 million people who play mini (put-putt) golf, 15 million of whom haven’t hit the links. Look for the continuation of the trend of adding putting courses and expanded ranges to traditional facilities in an effort to engage the entire family. This movement is directly aimed at making the game more fun.